Frustrated by the lack of color options and choices for very soft pastels, Terry Ludwig began experimenting with formulating his own pastels in 1995. His goal was to create a vast array of color in pastels that were uniformly soft across all densities of hue. The result was the development of intense colors, in unique hues that are unavailable in other pastel lines. 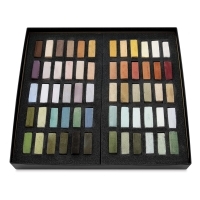 These hand-crafted pastels contain a broad range of pigments and minimal natural binders, rendering highly concentrated, velvety pastels. The square shape delivers thick, broad strokes and thin, precise lines. Intense Darks, the hallmark of the line, features bright acidic greens, a broad range of intense reds, and eggplant purples that have been described as "the new black." 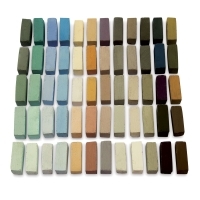 Individual pastels measure approximately 1½" × ½" × ½" (38 mm × 13 mm × 13 mm). Because each pastel is hand-crafted, their size and shape may vary slightly. Vibrants, Set of 60 — The Vibrants Set is so juicy and bold, it's destined to be the next "must-have" in your Terry Ludwig Pastels collection. A deep magenta pigment has been used to create 60 vibrant new colors. Richard McKinley Landscape, Set of 60 — A highly acclaimed landscape artist and a very popular instructor, Richard McKinley selected this set of landscape colors for his workshop students to use. Sunrise-Sunset, Set of 60 — Achieve stunning sunrise and sunset pastel paintings with the Terry Ludwig Sunrise-Sunset collection. What makes it special? 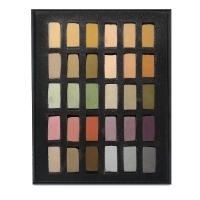 The set contains 40 new colors for capturing every nuance. Plein Air Landscape Colors, Set of 60 — Artist Deborah Paris personally chose this selection for landscape painters working in a variety of environments. The set includes 60 pastels. Stunning Yellows, Set of 30 — Created in response to customer requests for more yellow sticks, this set offers yellows with a variety of undertones. Arid Landscape, Set of 60 — Developed for high desert landscapes, this set of 60 pastels features neutral greens, clear blue skies, and a great selection of landscape basics. Southeast Landscape, Set of 60 — Humid and steamy, the American Southeast landscape contains warm greens, bright florals, and misty blues like nowhere else. Pastelist Marsha Savage put these unique colors together in a 60-piece set for artists of the Southeast, and worldwide, to enjoy. True Lights, Set of 30 — If you thought Terry Ludwig was all about the darks, come see the light! These soft super-light pastels don’t chip or crumble, but are as creamy as any other color in the line. 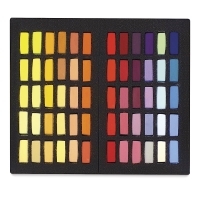 The set of 30 soft pastels includes 15 colors, two truly light values of each, including Warm Red, Cool Red, Warm Yellow + Warm Red, Yellow Ochre, Warm Yellow, Green + Yellow Ochre, Green + Turquoise, Turquoise, Ultramarine Blue, Cobalt, Warm Red + Cobalt, Violet, Raw Umber, Ultramarine Blue + Terra Rosa + Yellow Ochre, and Black. Maggie Price Grays, Set of 30 — Maggie Price explained it well when she wrote, "This is a set of 30 pastel sticks, five values each of six colors of gray. Not black-and-white gray, but blue-gray, purple-gray, green-gray, red-gray, teal-gray, and yellow/brown-gray ... colors I have searched for, wanted, and never had until now." Basic Landscape Colors, Set of 30 — Start your collection of Terry Ludwig Pastels with this set of 30 landscape shades. 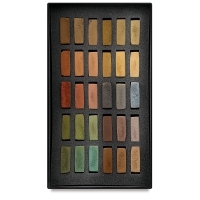 It includes a broad range of greens, browns, neutrals, and highlights. Umber Shadows and Shades, Set of 30 — Terry has created 30 new colors with a foundation of raw umber, a pigment never before used in a Terry Ludwig pastel. These soft, creamy pastels are perfect for landscapes, portraits, feathers, and fur, or for filling the gaps in your pastel palette. Shades of Nature, Set of 30 — Terry Ludwig recreated the shades of nature using a foundation of deep ochre in this set of 30 colors. 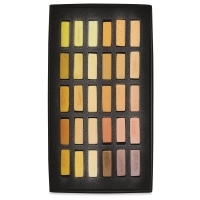 Soft and creamy, these pastels are perfect for the muted colors of spring, fall, and winter. Unique to Terry Ludwig Pastels, you won’t find these colors in any other pastel sets. Best Loved Basics, Set of 14 — The colors in this 14-color set range from the dark to light values that every artist needs. This set of Best Loved Basics will be especially enjoyed by artists who are new to the medium, as well as long-time pastel artists. For instructors, this set is a must for your students. Intense Darks I, Set of 30 — These are the hallmark of the Terry Ludwig Pastels line. Uniformly soft, without hard spots or crumbling, these darks are unrivaled in the industry. The set contains 30 colors, including bright, acidic greens, a broad range of intense reds, and the eggplant purples that have been described as "the new black." Turquoise, Set of 30 — This is a set of 30 turquoise essentials for water and sky. Basic Portrait Colors, Set of 30 — This set contains 30 assorted colors thate are absolute necessities for portrait artists! Cool Greens, Set of 30 — This set includes 30 distinct values of cool blue and green colors. Warm Greens, Set of 30 — This set includes 30 distinct warm greens, organized by value. It is a wonderful addition to any landscape palette. Intense Darks II, Set of 30 — This set includes 30 Intense Dark colors, including deeper, darker browns, rich turquoise, shadowy blues, and mysterious purples. 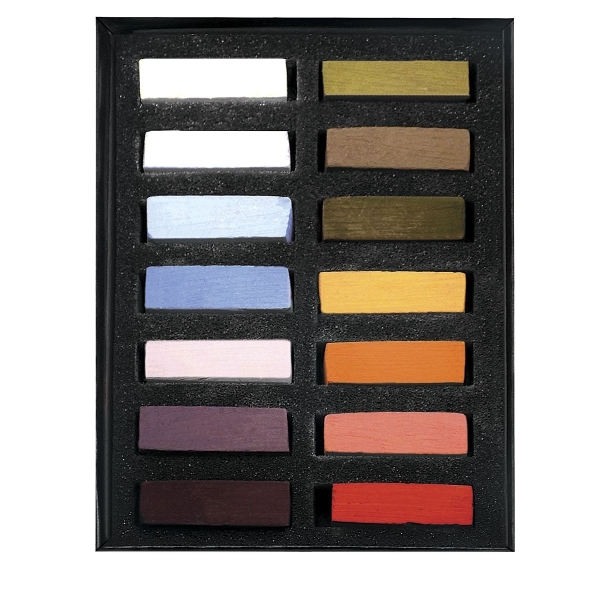 Intense Darks, Set of 60 — This set includes Intense Darks I and II for a comprehensive set of 60 Intense Dark pastels packaged in two boxes of 30 sticks each. Neutral Greens, Set of 30 — This set is a "must have" for the landscape painter. It's a great collection for still life and portrait painting as well! The set includes 30 colors. 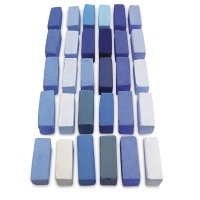 Best of the Best Blues, Set of 30 — This set of 30 colors has been personally selected by Terry Ludwig and contains the blues most frequently requested by artists who paint skies, water, and anything else blue. Liz Haywood-Sullivan Landscape Colors, Set of 30 — This set of 30 landscape shades was compiled by renowned artist Liz Haywood-Sullivan for her workshop participants, and has now been made available to all artists who want to benefit from her eye for beautiful landscapes. Liz Haywood-Sullivan Skies and Water Colors, Set of 60 — This set of 60 pastels was hand-chosen by renowned artist Liz Haywood-Sullivan. A great set for pastelists interested in painting landscapes, skies, and water, it contains colors not commonly found in other sets, including Blues and Grays specifically formulated only for this set. 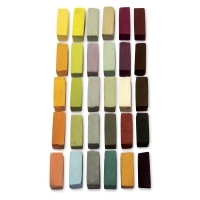 Maggie Price Basic Values, Set of 60 — This set of 60 pastels is organized into 12 color families. Each family contains 5 values, arranged from darkest to lightest. Portrait II, Set of 60 — When the Portrait Society of America asked Terry Ludwig Pastels to be an elite vendor at its annual conference, Ludwig rose to the challenge. Working with an exclusive panel of noted portrait artists, he created an authoritative set of 60 portrait hues as an addition to his Basic Portrait 30-piece set. 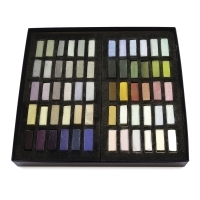 This set includes 18 colors that are new to the Terry Ludwig Pastels line.